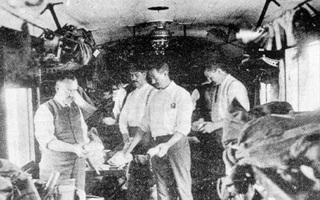 The following joint stock carriages were used in the days of the "Intercolonial Express", prior to the introduction of the Vestibule carriages in 1907. All joint stock cars in this series were prefixed with the letter "O". Boudoir car built by Mann Boudoir Car Company; New York. Renamed "Willochra". Boudoir car built by Mann Boudoir Car Company; New York. Renamed "Avon". 2.12.1911 Altered to sleep/diner and named "Avon". Boudoir car built by Mann Boudoir Car Company; New York. Renamed "Mildura". 3.1908 To Victorian Railways as sleeping car. 14.8.1908 Altered to sleep/diner and named "Mildura". Boudoir car built by Mann Boudoir Car Company; New York. Converted to South Australian Railways "Vice Regal" car. 3.1908 To South Australian Railways car "117". Composite 1st and 2nd class bogie carriage built by the Victorian Railways Locomotive and carriage department. 4.1900 To South Australian Railways as "233". 4.1900 To South Australian Railways as "234". 4.1900 To South Australian Railways as "235". Composite 1st and 2nd class bogie carriage built by the Victorian Railways Newport Workshops. 4.1900 To Victorian Railways as "78 ABAB. 4.1900 To South Australian Railways as "236". 4.1900 To South Australian Railways as "237". 4.1900 To Victorian Railways as "79 AbAB". Passenger bogie brake van built by the Victorian Railways Newport Workshops. 3.1908 To South Australian Railways as "7 ". Passenger bogie brake van with end cupola built by the South Australian Railways Adelaide locomotive works. Bogie Post Office mail van built by the South Australian Railways Adelaide locomotive works. 13.1.1887 Issued to service as "O 18". 4.1908 To South Australian Railways as number "258". 19.9.1916 Altered to Officers Inspection car "Murray". 4.1908 To South Australian Railways as number "259". Bogie mail baggage van built by the South Australian Railways Adelaide locomotive works. 1910 To Ways and Works van "3 WW". Bogie brake and luggage van with end cupola, built by the South Australian Railways Adelaide locomotive works. 3.1908 To South Australian Railways "58". 3.1908 To South Australian Railways and renumbered "68". 15.8.1919 Body rebuilt with guards compartment relocated from end to centre. 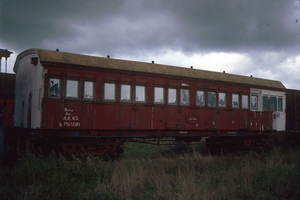 21.5.1930 Altered for used as a railcar trailer. 4.4.1941 Altered for fish traffic. Composite 1st and 2nd class bogie carriage, built by the South Australian Railways Adelaide locomotive works. 4.1900 To South Australian Railways "238". Composite 1st and 2nd class bogie carriage, built by the Victorian Railways Newport Workshops. 4.1900 To Victorian Railways as "80 ABAB". 4.1900 To Victorian Railways as "81 ABAB". 4.1900 To Victorian Railways as "82 ABAB". Boudoir car built by Mann Boudoir Car Company; New York. (May have been assembled at the Victorian Railways Newport Workshops). Boudoir car built by Mann Boudoir Car Company; New York. 10.1.1920 To South Australian Railways. 1st class vestibule built by Coleman & Party, at the Victorian Railways at the Newport workshops, ex "21 AV". 1908 Returned to Victorian Railways as "21 AV"
1st class vestibule built by Murdoch & Party, at the Victorian Railways at the Newport workshops, ex "26 AV". 1908 Returned to Victorian Railways as "26 AV". 2nd class vestibule built by Higgins & Party, at the Victorian Railways at the Newport workshops, ex "23 BV". 1908 Returned to Victorian Railways as "23 BV". 1st class vestibule built by Hambridge & Party, at the Victorian Railways at the Newport workshops, ex "5 AV". 1908 Returned to Victorian Railways as "5 AV". 1st class vestibule built by Saddington & Party, at the Victorian Railways at the Newport workshops, ex "11 AV". 1908 Returned to Victorian Railways as "11 AV". 2nd class vestibule built by Cameron & Party, at the Victorian Railways at the Newport workshops, ex "6 BV". 1908 Returned to Victorian Railways as "6 BV". 1st class vestibule built by the South Australian Railways at the Islington workshops, ex "181". 9.1900 Transferred to use as a Joint Stock car. 1st class vestibule built by the South Australian Railways at the Islington workshops, ex "182". 1st class vestibule built by the South Australian Railways at the Islington workshops, ex "183". 2nd class vestibule built by the South Australian Railways at the Islington workshops, ex "192". 2nd class vestibule built by the South Australian Railways at the Islington workshops, ex "193". 2nd class vestibule built by the South Australian Railways at the Islington workshops, ex "196".